The Water Barons are torn apart by schisms in their beliefs and actions. One has fallen in battle. Another hears the cry of his distant kin, far to the north, and wishes to help them. 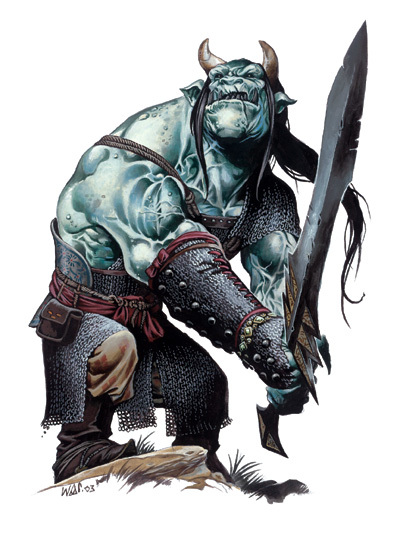 But before the party can unite to free the enslaved orcs, they must deal with the ogres near Bordertown. Mercenaries at heart, the ogres have taken to exploiting the local community for profit. When the Water Barons seek to enlist their aid to help them free the orcs, the ogres demand payment up front. Inexplicably, the Water Barons fail to grasp the basic fact that mercenaries, even if they are ogres, want to be paid before they fight. Find out how stubborn and violent the players can be when NPCs refuse to fight deadly battles for them for free. Strangely enough, I was actually super-impressed with Tom throughout this episode. His RPing was great, and he stayed sane while everyone else had a cow (and Dan died). Hooray for transitional episodes, I guess. I didn’t mean to imply that this episode is in anyway bad or unentertaining. And I’d like to give a shout out to Tom, for maintaining the very difficult Lawful-Good alignment in a group of Unaligned, Chaotic Troublemaking, and evil characters. Ever since Lowcrag was first alluded to in the main podcast, I had suspected that RJ did not create acharacter conducive to his style of play. His debating with Thelonious over the profitability of Fire/Thunderheart only confirmed my suspicion. Not to mention Lowcrag’s speech in the town’s square, drawing a comparison between the current adversity experienced by the citizens and the genrations of strife Lowcrag’s people endured. Not saying it was bad role-playing, but I feel that a Shaman or some other Leader would have been more fitting for Lowcrag. I have to agree about Lowcrag (sp?). At several points I found myself going “wait…what IS his INT?” He seems a little too well-spoken to be a Barbarian. I’m not saying he should do nothing but Conan impersonations, but at points his speech sounded a little too wordy and verbose, especially given his tendency to launch into epic speeches. I could be wrong, maybe his INT is really high for a barbarian striker. Not ragging on RJ, because he’s a good roleplayer and very entertaining, but he seems too intellectual (in character). I have to disagree about Locrag. The fact that he has a (moderate) intelligence is likely a part of his Demigod-hood and the fact that he is the leader of his village. The fact that RJ is playing him as an elegant, if brutish, leader rings true to me. “Oh I forgot to mention I’m Uncle Fuestis?” Hilarious. That stretch of 20 seconds was priceless. Since the last episode, I have this growing fear whenever everyone gets together (sans Vashikk) that they will decide that they have a must “Do what must be done” dicussion and slaughter the Dragonborn. Although there is hope yet for the New World!. Pontifex, Jack Morgan and Vashikk combined may have the power to end the evil schemes of the Legion of Doom…I mean the Water Barons. The New World Campaign just gets more and more convoluted. Like everybody else, I love that Tom stayed true to his dragonborn’s principle, however, I don’t know if Vashik would let one of his own adventuring party kill a citizen of new arsenal (even a traitor) without a circumspect investigation. I loved how Ross poked and prodded his players. Listening to Ross antagonize his players was a thing of beauty.